B. Thomas (Arlington, Texas, United States) on 31 August 2013 in Landscape & Rural and Portfolio. 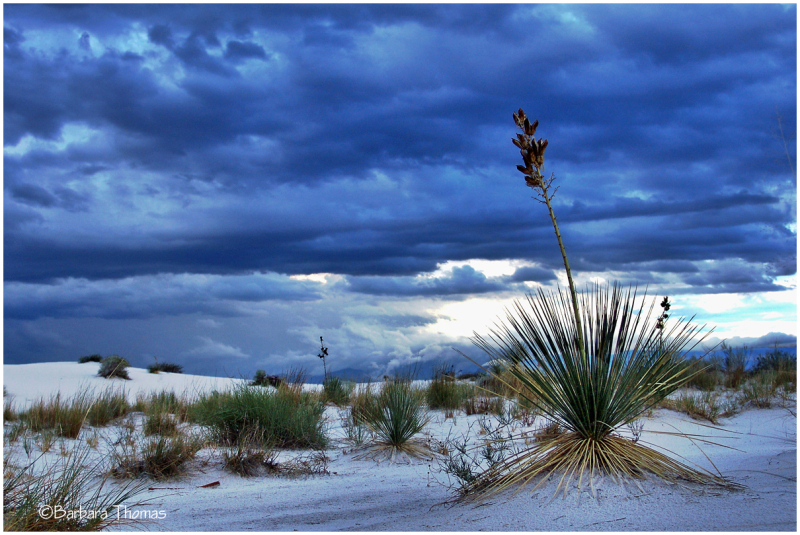 White Sands, New Mexico. Color version of yesterday's black & white. What a beautiful series sharing here !!! @Catherine: Thanks, Catherine! Glad you like the series. I do today's colour photo best. Beautiful ! Superb composition and colors . Love that moody sky. A great shot. Yes, yes ... I do like this one better, but the elements are the same. I thought the B&W was wonderful, this is spectacular! The dramatic colors are gorgeous!!! This is a wonderful shot. Love the color of the sky! interesting how the light and colour tones change! love the blues here! Tout aussi beau en couleur qu'en NB quelle compo et vue génial sueprbe. Much better in color ... the contrasts are magnificent !!! Congrats on the color spotlight, Barbara. @Julie L. Brown: Thanks, Julie. Feels and looks like our winter! Congratulations on the Spotlight - although my own fave in the set, so far, remains 'After the Rain'. @Ronnie 2¢: Thanks, Ronnie. I was happy with that one too. Congratulations on 'The Color Spotlight'. It's very beautiful. ..;and congratulations on the spotlight ! Great one; just like your bw version. First time I've remixed 2 versions of the same photo! Congratulations, Barbara ... well deserving of the Spotlight! @Judy aka L@dybug: Thank you, Judy. Wonderful colors! I liked a lot "after the rain", but this one is, to me, stronger and with better composition. I love those blue tonalities, and the contrast with green and white zones. I prefer this colored version!! It conveys more good feelings to me ;-) Congrats on this Spotlight, Barbara!! @Josep: Thanks, Josep. I almost always prefer color shots. I played around a little with processing on "After the Rain" but posted this shot pretty much as it was. This better captured the mood of the place that evening. STUNNING and very well done. @Denny Jump Photo: Thanks, Denny. This is just stunning! Congratulations on the Spotlight! Congratulations. Great composition and color. Well done. Hey, Barbara, congratulations on the Color Spotlight. Well deserved. Such a great capture...love the colors very much! fantastic colours in a fantastic image! very belated but sincere congrats on the colour spot !! !